Dominic Olney's long throw almost produced a way back into the game for Southam. With manager Alex Baird continuing to reshape his squad, Saints travelled to Nuneaton in optimistic mood but came away with their tails between their legs after another heavy defeat. The first half was competitively fought and although the home side enjoyed the majority of the possession, Saints were in the game despite two errors gifting a goal to Matty Brennan after six minutes and an own goal in the 12th minute. What was to prove Southam’s best chance of the match came two minutes before the interval. Dominic Olney’s long throw was flicked on at the near post and debutant Dan Russell’s powerful header looked destined for the net before home keeper George Woodward produced a fine fingertip save to push the ball over the bar. Southam simply failed to turn up after the break, allowing the home side to attack at will as the match turned into what one spectator accurately described as “a turkey shoot”. 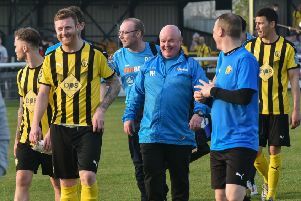 Brennan was allowed to complete his hat-trick and additional goals were all too easily conceded to Tyson Knight, Jack Leech and Harry Walker-Donovan, forcing Baird to take to Twitter after the game. “I would like to apologise to Saints fans who travelled to Nuneaton to support us today,” he said. “We were woefully bad in the second half. Saints entertain Leicester Road on Saturday.